Almost everywhere, especially dry roadsides, railroads, fields, and disturbed places; rock shores and cliffs, dry savannas, grasslands; less often in moist ground (sometimes peaty), shores, river banks, and meadows. Although weedy in habit, most of our plants are presumably native. Achillea millefolium, as treated here and in most other recent works, is a polyploid complex of native and introduced plants that hybridize and intergrade with one another. There is an apparent gradient from north to south in decreasing incidence of dark-bordered phyllaries (with various shades of intermediate and light brown also occurring). Plants with rays light to deep pink are rather frequently found. Some of the deepest magenta shade are doubtless cultivars of the Eurasian species and some may well be (as documented in Quebec) pentaploid hybrids. Native tetraploids tend to have a lighter rosy shade. 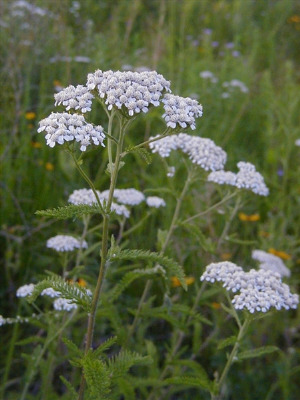 Yarrow has a strong aroma, especially when bruised, though less intense than that of Tanacetum. MICHIGAN FLORA ONLINE. A. A. Reznicek, E. G. Voss, & B. S. Walters. February 2011. University of Michigan. Web. 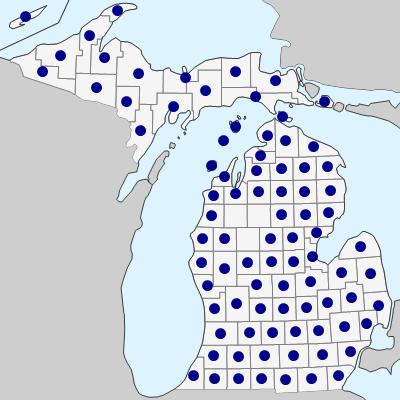 April 26, 2019. https://michiganflora.net/species.aspx?id=207.